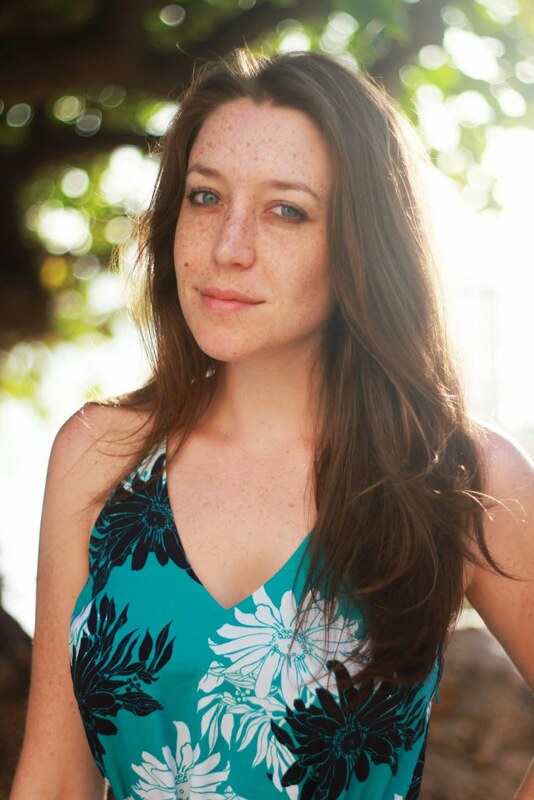 I've been meaning to share my skincare and beauty routine for a while now as I feel like I've got it dialed in for this stage of my life - going lighter, more natural (in more ways than one), and working with what I've got instead of making something out of what I don't have. 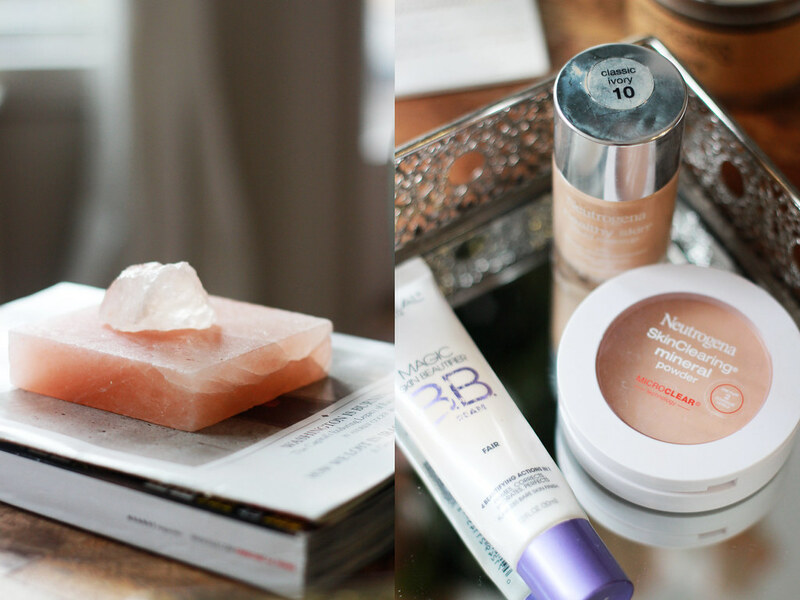 Below are some of my favorite beauty products and my daily routine. 1. Neutrogena Purifying Facial Cleanser - In the morning in the shower, I wash my face with this lovely-smelling Neutrogena all-natural cleanser. It's not harsh and it gently gets my face awake for the day ahead. 2. Neutrogena Oil Free Moisture - I moisturize, sunny or not, with this perfect moisturizer that's a) for sensitive skin, b) oil-free, and c) SPF 15. I've been using it for years and so has my Mom. Not a complaint! It's not thick or greasy and I hardly feel it after I apply it to my face and neck. 3. Neutrogena Purifying Cream Cleanser - At night, when I shower, I use the Neutrogena Purifying Cream Cleanser to wash off make-up and impurities from the day without over-drying my skin or using harsh chemicals. It is a brand-new product that I just added to my routine, but I am already seeing markedly less mini-break-outs. I think the key for me is avoiding over-drying my skin with too many harsh chemicals. *My daily body moisturizer, not pictured, is the hypo-allergenic Lubriderm. It doesn't smell great, but it does the trick and never irritates my already hive/rash prone skin. To launch into my make-up routine, I'll first preface it with the fact that I've been attempting to hone a workable make-up routine for years and that I just discovered BB cream. That's a sad statement even to write, especially for someone with freckles. Again, my skin is pretty naturally dry and only prone to break-outs on the chin (hormonal break-out zone), and very sensitive, so I try to use sensitive skin products. 1. L'Oreal BB Cream - If you're a freckled person, or anyone looking for a light no-make-up look that evens skin tone, BB cream is where it's at. How I didn't realize this originally is beyond me, but I finally remedied it! This cream makes foundation use often unnecessary and I only follow through with the rest of the routine if my skin is looking broken-out or quite pale. 2. Neutrogena Healthy Skin Foundation - I love this foundation as it's very light (for my pale skin) and has a healthy amount of coverage without being too sticky or obvious. I think it blends well with my other make-up and can be used on singular spots without full coverage if needed. 3. Neutrogena SkinClearing Mineral Power - This power is a new favorite of mine after a recent incident with a powder that made my skin look yellow in all light and photos. I was horrified to see my face looking jaundiced in a photo and immediately ditched my old powder for this one. It's, again, light and blends well with my other make-up. For my eyes and my cheeks, I have had a bit of a struggle finding the right products. These few have risen to the top. I am still without a favorite eyeliner, so if you have recommendations, let me know! 1. Maybelline Pumped Up Volume Express Mascara or Neutrogena Mascara - I use the Maybelline mascara when I want big lashes, for going out, or for days when I forgo eyeliner. 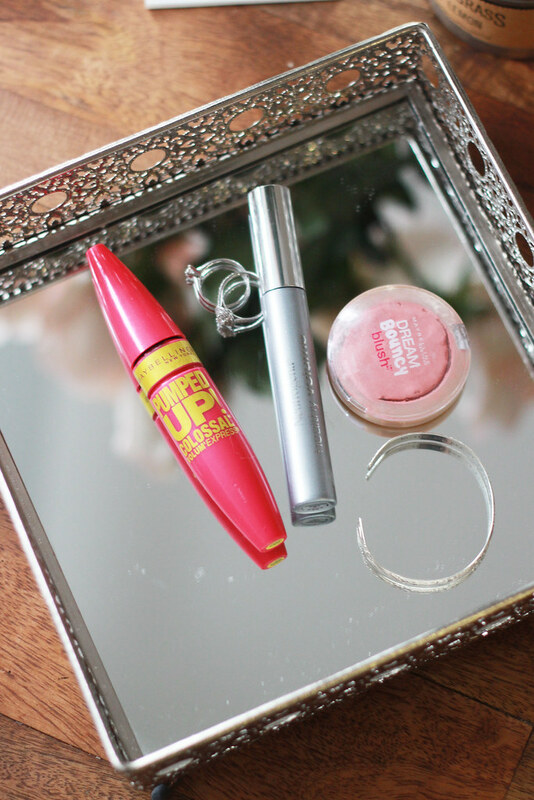 It gives some amazing volume and curl and it's a favorite mascara for oomph. When I am using some eyeliner (usually a revolving door of brown eyeliners that are self sharpening, not pictured) and don't need big lashes, I usually use a basic Neutrogena mascara. 2. Maybelline Dream Bouncy Blush - I am a huge fan of cream blushes and after running out of my L'Oreal cream blush and not being able to find a good alternative in stores, I went without blush for ages. When the summer hit and I heard about Maybelline's dream bouncy blush, I immediately snagged it. It's fun, actually bouncy (not sure what's going on there) and it blends extremely well. I can't stand a harsh blush line and so this is light and fun enough to just make you look rosy cheeked. As for lips? I like to use balms and moisturizing lip tint instead of lipstick, though I have dabbled in some Revlon shades for work. 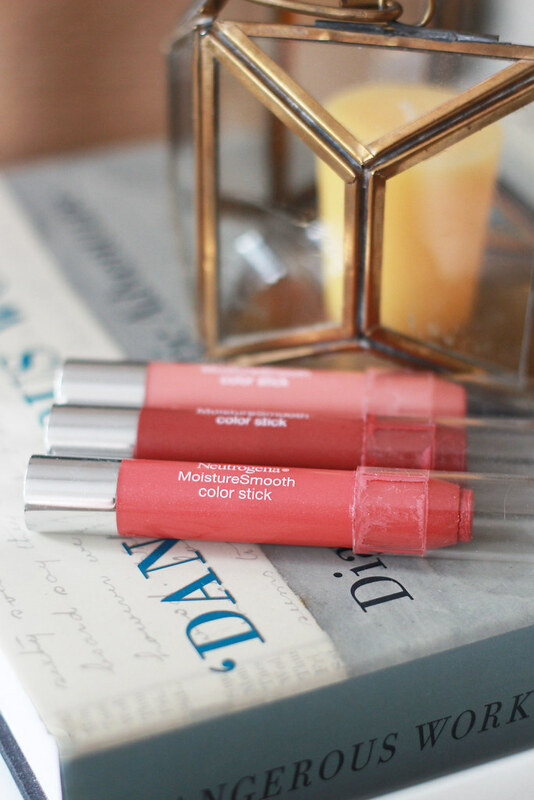 These Neutrogena MoistureSmooth Color Stick, like the Clinique and Revlon line, are more like chapstick with a great color. I adore them and have them in many colors! 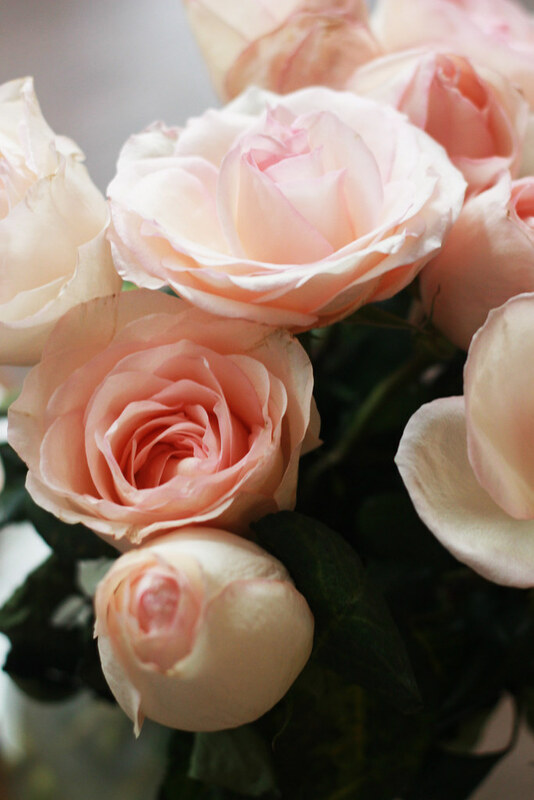 If this color palette of rosy pink and mauve doesn't entice you, then the smell and easy application will! These smell sweet, look lovely in your purse, and are the easiest to apply on the go. I never worry about them transferring to my teeth or looking haphazardly applied without a mirror. My fragrance collection has changed over the years from the teen years of Clinique Happy Heart, to college with Bulgari White and then to the weird inbetween time when I wore something Nicole Ritchie. 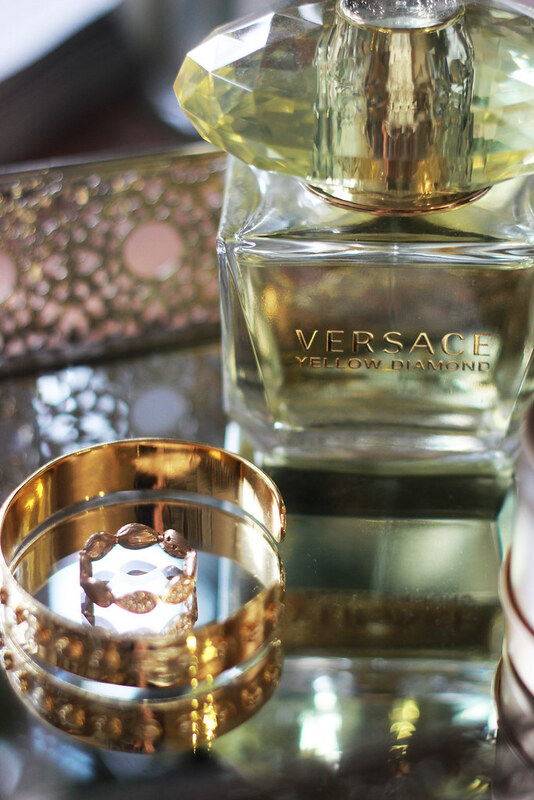 I recently wrote about making this new fragrance addition and I am still just as in love with this Versace Yellow Diamond perfume. It smells adult, isn't cloying or too sweet. Instead it has woody undertones and the top notes are full of citrus and bergamot. 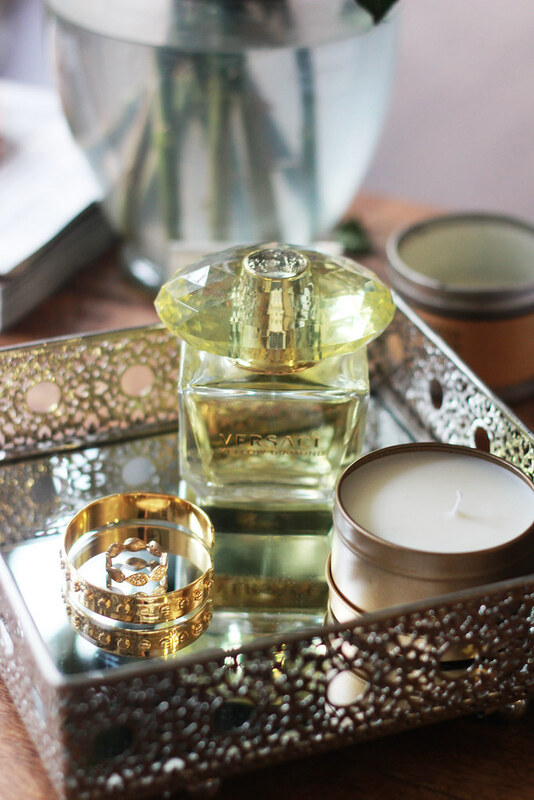 The perfect spicy perfume to kick off every single day. 1. For base, top, and color - I love the Formula X line from Sephora. It lasts, only requires one coat of color, and doesn't chip. 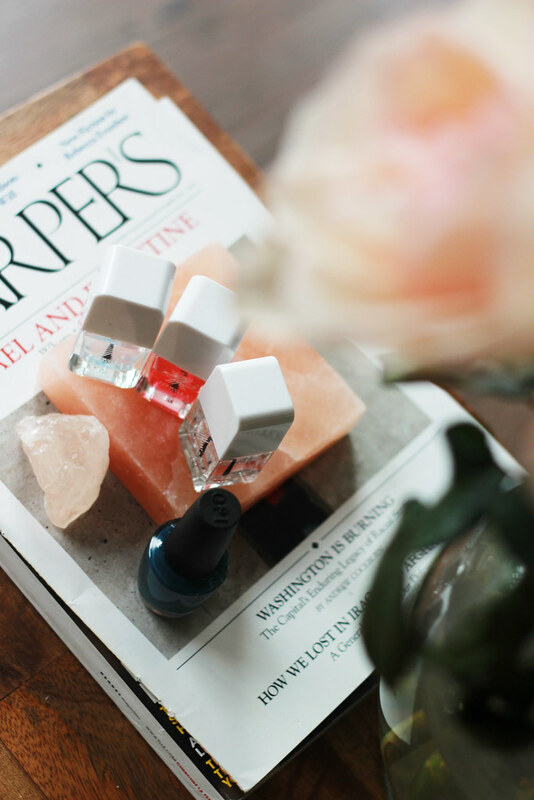 It's a miracle for at-home manicures for people that don't have time to repaint on a regular basis. I have a ton of polishes from this collection and they're a good deal at only about $10.50 a polish and the colors are on-target. 2. I'm also still a big fan of OPI polishes as the colors are fantastic and they also don't chip as quickly. You do need to layer on multiple coats for great color, but I also use the Formula X system with my OPI polish to prevent chipping! 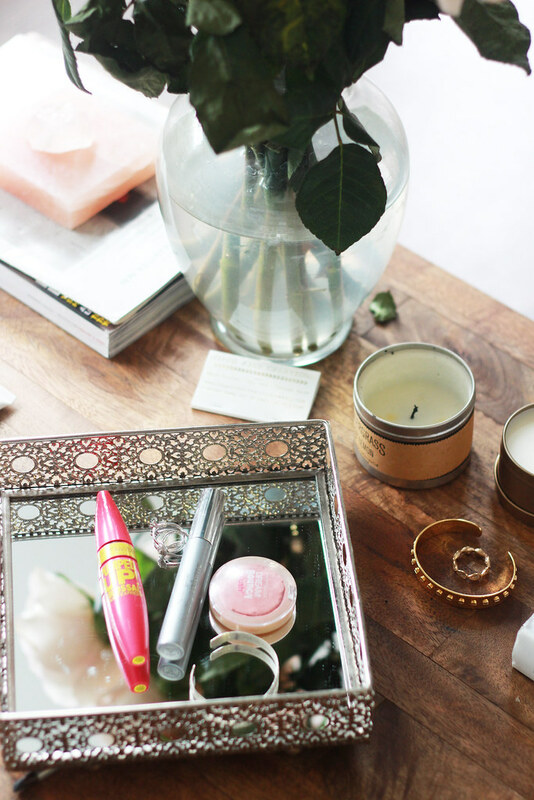 What are your must-have beauty products? I'm always interested in hearing about awesome options that will make my routine easier! 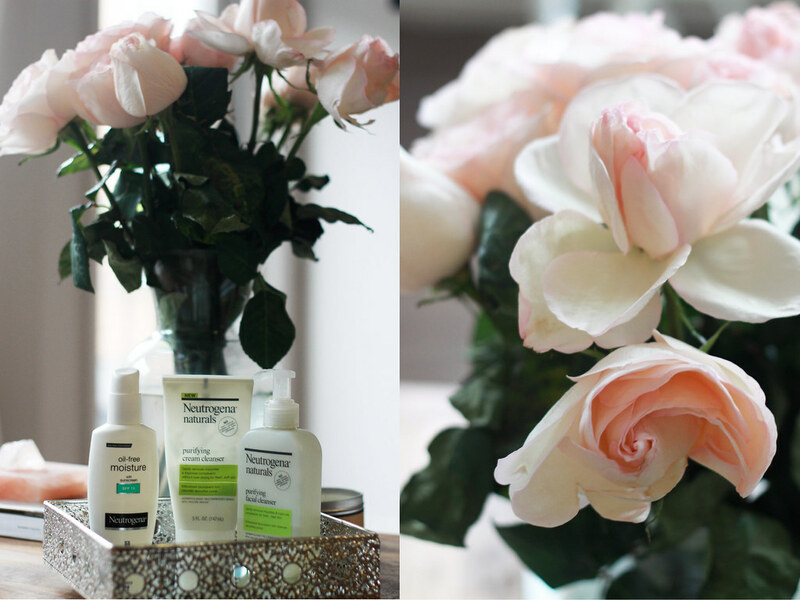 *I am part of the Neutrogena Ambassadors program this year, so I received a few of these items for review and as a partner with Neutrogena. 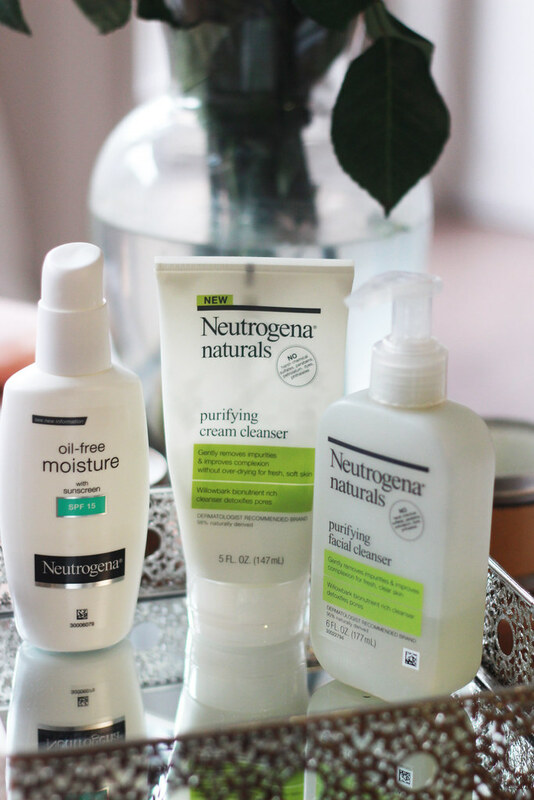 The opinions above are my own and Neutrogena has long been a beauty go-to for me.